Nanette Fink-Eaton - Rates Surged to 5% This Week. Is There Any Hope? For the first time since early 2011, the average mortgage lender is quoting conventional 30yr fixed rates of 5.0%. This happened fairly quickly too, with an increase of 0.25% just in the past 3 days. What's causing all this drama and is there any hope that it will subside? A Federal Reserve (aka “The Fed”) that’s more willing to hike its policy rate while continuing to reduce the amount of bonds it buys each month. (Foreign central banks are also moving toward policy tightening). Fiscal policies such as the tax bill that require government borrowing, thus creating excess supply in the bond market. More supply = lower bond prices = higher rates. Fiscal policies such as the tax bill that may add to economic growth and inflation. Growth and inflation generally contribute to higher rates. 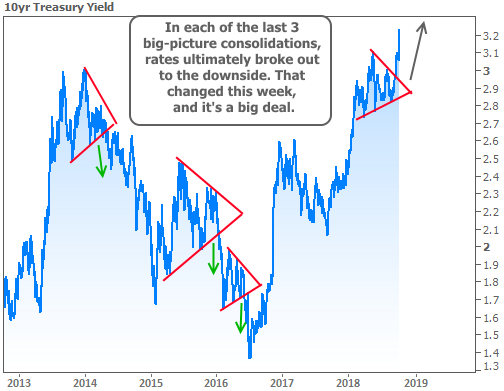 The most recent manifestation of this “coming to terms” process was this week’s break above 3.0% in the 10yr Treasury Yield--the yardstick against which all other long-term rates in the US are measured. It would have been shocking had we NOT seen 10yr yields above 3% this year. If you stack up the headwinds listed above and compare them to the last time rates were 3%, there’s no question that market fundamentals say rates should be higher. Last but not least, the lowest unemployment rate since the 1960's. Before September, traders were feeling at least somewhat skeptical that the economic expansion could not only be maintained, but actually surge into stronger territory. VERY simply put: there's a price to pay for that surge, and a fairly hefty price at that. This isn't just another random move higher in rates. This is a relatively gut-wrenching confirmation of what we were hoping not to see. For the first time in years, a large-scale period of indecision and consolidation in rates (marked by the red lines below) has given way to a break HIGHER as opposed to lower. 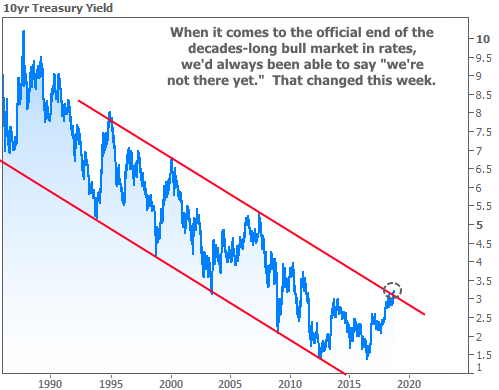 On an even grander scale, this week is the first time in decades that we can't simply fall back on the fact that rates were still inside the super-long-term downtrend seen below. But what about mortgage rates? You may have seen a headline or two suggesting this week's mortgage rates were actually lower than last week's. That unfortunate reality is due to some reporters' over-reliance on Freddie Mac's mortgage rate benchmark. It's unfortunate because Freddie's rate is based almost entirely on Mon/Tue rates (read about this phenomenon in detail HERE). In other words, the rates on the first 2 days of this week were indeed microscopically better than the rates on the first 2 days of last week. Freddie issues a press release to that effect every Thursday, and many reporters rely on that press release to craft headlines about "this week's mortgage rates." Point being: as long as you consider Wed-Fri to be part of "this week," those reporters are wrong, I'm right, and rates are through the roof! This is all pretty bleak. Is there any hope? First off, please be prepared for the possibility that there won't be much hope--at least not for a while. When markets undergo massive reassessments of reality--which could be what we're seeing here--it can take months before seeing the rates that were available just before the spike. A stark, recent example is the 2013 taper tantrum, where it took nearly 3 years for rates to finally make it back to where they were when many "experts" were still saying the whole thing was overdone and would blow over. That's the cautionary statement, and it's good to keep that in mind any time you're tempted to assume rates should bounce lower just because they've moved too high, too fast. But there's an optimistic statement too. More often than not, when rates move too high, too fast, they actually do experience a bounce. We certainly can't rule out that possibility this time as well. One caveat is that, unlike 2013, rates aren't presently reacting to one gigantic surprise. Back then, it was the Fed FINALLY breaking the bad news to markets about reducing its bond buying program. That was viewed as the end of an era. This time around, we're much more dependent on a wide variety of economic data and geopolitical risks. Right now, the data is stellar and the other risks are suppressed. To whatever extent that changes, so too could the fate of interest rates. The most important flash point on the near-term horizon is next Thursday's Consumer Price Index. That's a key inflation report that's expected to come in strong due to strength in wages. An isolated misstep in that data wouldn't be enough to change the big picture challenges for rates, but it could play a part in a short-term reprieve. We won't talk about what might happen if it comes in hotter than expected, and we'll hope not to be forced to talk about it next Friday.